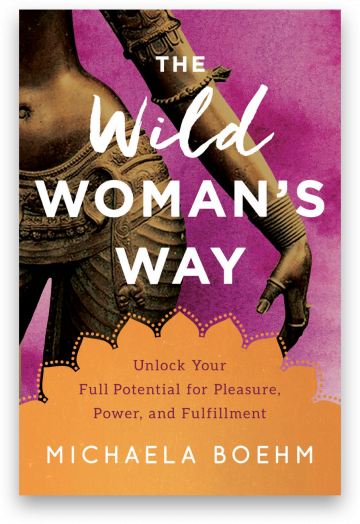 Listen to Will Smith talk about Michaela and her new book "The Wild Woman's Way". Now Open For Enrollment! Join the international group of women and receive practices, videos, lectures and Q&A calls. Australia | Europe | United States Accepting applications for Men's and Women's 9-Month Study Groups for 2019! Michaela is like my real life version of Yoda meets the Elf Queen from Lord of the Rings, meets The Oracle from the Matrix, meets any other archetypal guiding figure you can think of….Basically she is a lot of help. I think she can advise men and women equally well and I trust in her ability to assist in any situation. Michaela is the most trusted life advisor I have. Michaela Boehm is the most trusted life advisor I have. She has unbeatable combination of listening, insight, communication, compassion and kick-assery that gets my life and relationships on track every time. I’m not an easy client — so Michaela is my super-high-quality go-to person when I want to get over a really stuck place fast. She literally gives me my life back when I mess it up. I have learned to trust her so much, I just do what she says right away.